Trying to plan a trip using just a smartphone tends to be a hassle. You might have a half-dozen browser tabs and a few different apps that you’re using for research, and can easily get lost bouncing between them all. Chances are, you end up abandoning the whole process and switching to a laptop. Google believes it has solved this problem with a new search tool for smartphones, called Destinations on Google. 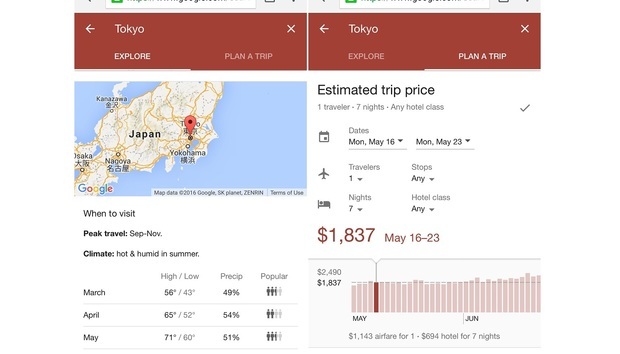 With certain search terms, Google will spit back summaries of different trips you can take, including flight costs, hotel rates, and things to do. “[I]nstead of jumping between a dozen links or tabs to get the information you need, you can sit back and scroll—and leave the heavy lifting to us,” Google says. Tapping on any of these places leads to a page with greater detail, including itineraries, top sights, an estimated total trip price, and the weather at different times of the year. There’s also a “Plan a Trip” tab where you view total trip costs at different times of the year, based on the length of stay and what class of hotel you’d like. Why this matters: Smartphones are increasingly becoming the first thing we reach for when we want information, but that’s never really worked well for travel plans because of how many different data sources we need to reference. Google is essentially trying to consolidate a dozen browser tabs into a single research tool, and it seems to work well at first glance. The only obvious thing that’s missing is some way to save all those data points for future reference—because who actually manages to plan an entire trip in one browsing session?